ASIFA-ATLANTA is joining a whole heap of amazing arts organizations! Come visit our table and animate, Atlanta! Continuing the dialogue amongst emerging creative organizations in the metro Atlanta area, GATHER ATLANTA is back for the Third Annual Creatives Networking Market to be held Saturday August 6th, at SCAD 3:00pm-7pm. Presented by BURNAWAY, MINT, ThoughtMarker and WonderRoot, GATHER ATLANTA 2011 is a networking market promoting and facilitating collaboration between Atlanta’s independent and emerging galleries, creative collectives and non-profits. "Atlanta is a city in which organic partnerships can be difficult, if not impossible to make under ordinary circumstances” says Erica Jamison, “Ours is a car culture that, depends on the public and our peers being willing to make the effort to drive to and participate in the various events and happenings around the city. 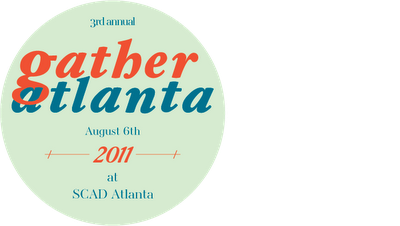 Gather Atlanta seeks to address this issue and facilitate partnerships between emerging arts organizations and the public." Attendees will have the opportunity to network, learn about a cross section of visual and performing arts groups, discover new cultural offerings and learn how they can support their local artists as well as metro Atlanta creative industries through volunteerism and active participation. In addition to these opportunities, there will also be a panel discussion focusing on the topic of “Partnerships and Collaborations”.